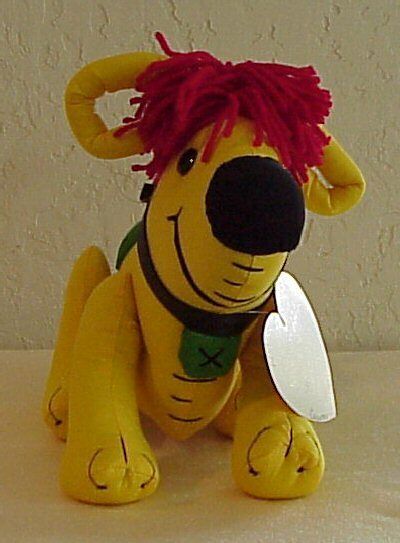 Straight from the Fairyland created by Johnny Gruelle in his delightful Raggedy Ann stories comes....." RAGGEDY ARTHUR".....Raggedy Ann & Raggedy Andy's ADORABLE little Yellow Dog..... a whimsical character doll that will steal your heart away! 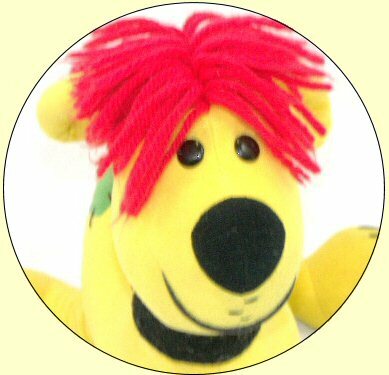 !.....Just one of the many Raggedy Character Dolls that I create!....WHY NOT COLLECT THEM ALL???...... Have a question? 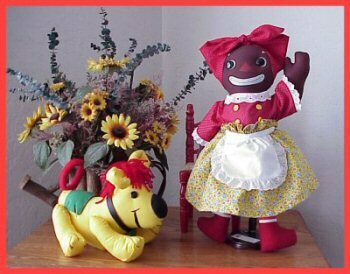 Just E-mail "Gayle" ......"Click Here"
Raggedy Ann & Andy's yellow Dog!
" 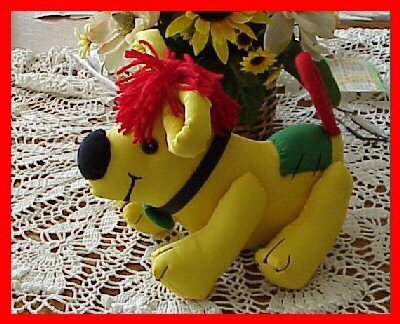 Knickerbocker Original Arthur "
This little Arthur the Yellow dog was a joy to do!!. His little legs are double jointed. I chose a bright yellow fabric for his body. He stands, sets, and lays down all by himself. What a posable little fellow he is! Lightly stuffed and hand-stitched on his bum....is his traditional green patch. Standing a proud 11 1/2" tall & 9" wide, he'll be the center of attention in your collection. 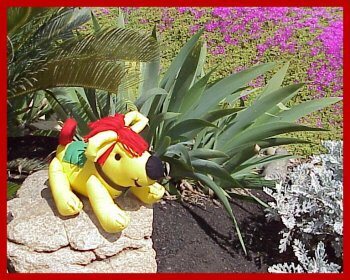 His sweet doggy grin is hand-embroidered, and his little round nose is a black velour fabric. characterisic of the Knickerbocker “Original” Arthur. 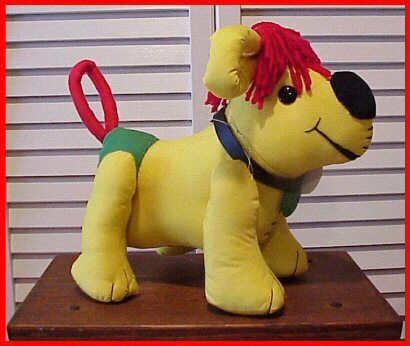 Plush red yarn was used to create his puppy moppy hair look. 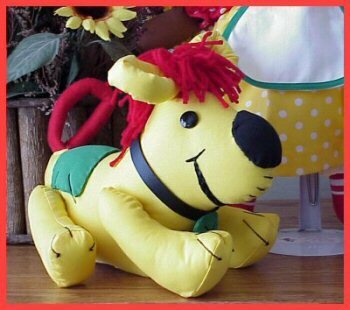 I designed my own pattern for this cloth dog from the picture of the original “doll” pictured in Susan Ann Garrison’s “ The Raggedy Ann & Andy Family Album” that I purchased on eBay. According to Garrison, Raggedy Arthur was never a character from Johnny Gruelle’s imagination, but was a creation of the Bobbs-Merrill Co., N.Y., in 1965. Although he is not an original “Gruelle” character…………I felt he should be preserved for future generations, since you rarely see an “original” and they are so expensive. Arthur is the next best thing to owning an “Original”! His hand-embroidered features capture the charming personality of the very hard to find Knickerbocker Arthur created in the 60’s. 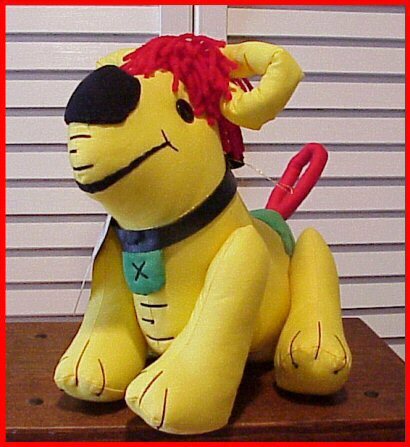 He has his “traditional” yellow looped ears and redlooped tail! which gives him that “Unique” Knickerbocker personality! I hope that you will enjoy my version of Knickerbocker’s Raggedy Arthur, I have tried very hard to "recreate" the original. 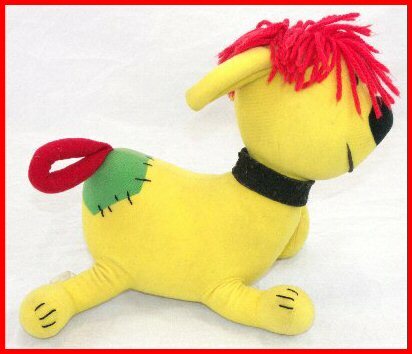 He was lots of fun to create…..and he will make a Colorful and Cheerful addition to every Raggedy Collection. 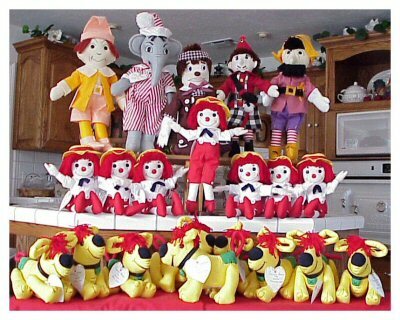 These delightful little "Character" dolls are patiently waiting for someone to adopt them and add them to their Raggedy family and most important of all......love him!! Each of my Raggedy Character dolls have their very own UNIQUE personality, and make wonderful conversation pieces. 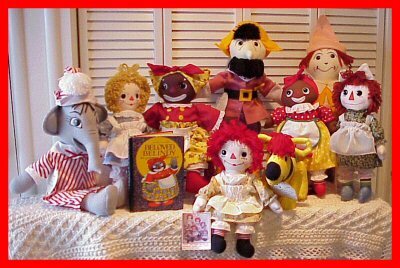 Each one is meticulously hand sewn with fabric and styling reminecent of Gruelle’s illustrations in his many Raggedy Storybooks. You will be well pleased by my quality craftmanship!! Each of my dolls is an Heirloom Quality Collectible Treasure that will add that one-of-a-kind distinction to your Collection. Destined to become a Treasured Family Heirloom for many generations to come! 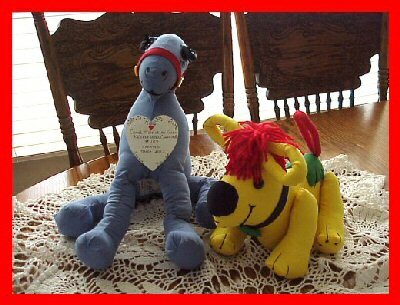 RAGGEDY ARTHUR was a great success at the Raggedy Festival in Arcola, Illinois in 2004...AND HE CONTINUES TO BE ONE OF MY BEST SELLERS ON E-bay and MY WEBSITE AS WELL! !